First Lutheran’s blanket sewers began a partnership with Lutheran World Relief in 1972 that continues to this day. Over the course of more than 40 years, over 5,000 quilts have been sent to uprooted people in need around the world as well as in our immediate neighborhood. Friends from the community join First Lutheran’s quilters every Monday from 10 a.m. until 2 p.m. in the fellowship hall for a day of sewing and sharing. Volunteers from First Lutheran and the wider Poughkeepsie community offer English Conversation practice, friendship and cultural orientation for Chinese immigrants working primarily in the local restaurant industry. Some volunteers arrange to meet Chinese friends in the Fellowship Hall at First Lutheran Church while others meet at the restaurants where they are employed. Homework assistance is also offered to the children of Chinese restaurant workers upon request. Given the long working hours, language barrier and resulting social isolation, First Lutheran’s “Welcome Center” model provides a way for these new immigrants to begin to acculturate and receive a sense of welcome from their new community. 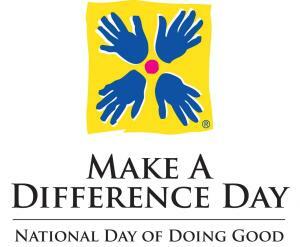 Call Pastor Deborah if you are interested in volunteering. 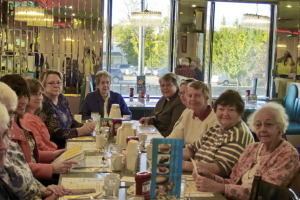 Members and friends of First Lutheran meet at the Acropolis Diner on alternating Thursday mornings at 9 AM for informal conversation and the sharing of our joys and sorrows. We gather the concerns of our community and individual requests into a brief time of prayer at the beginning of our meal. Come join us at the Acropolis Diner, 829 Main Street, Poughkeepsie, NY 12603. Visit our church calendar for the schedule. 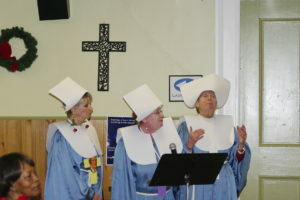 A special hallmark of this congregation is the warm and delicious hospitality offered to the whole community at our traditional fellowship dinners where plenty of laughter, some singing and dancing, and even an appearance or two of the rather eccentric “Sisters of Perpetual Motion” – an underground order of Lutheran nuns who missed their calling as stand-up comedians – is enjoyed. Our repertoire of meals each year features our German heritage, including the annual Oktoberfest and Sauerbraten Dinners but also includes a Ham Dinner, and a traditional Spaghetti Dinner. First Evangelical Lutheran is home to the Lunch ‘n Listen Music Series, which began in 1979 under the leadership of Dr. Hermann Wolff, and in more recent years has been led by Carol Reichert and Susan Russell. These free, monthly noontime concerts bring hundreds of people into our church to enjoy the talents of regional professional musicians as well as the beauty of our church sanctuary. All concerts begin on the first Wednesday of the month at noon. Doors open at 11:30 a.m. for “brown baggers” and coffee, tea and home baked goods by members of the congregation are available before and after the concerts in our fellowship hall. From its inception as a congregation, the people of First Lutheran have had a particular heart for uprooted people. This is because the founders of this congregation were among a group of German immigrants who fled the rise of Prussian militancy and the German Revolution between 1838 and 1855. The congregation was born on February 17, 1856 and purchased its present home at the corner of Mill and Catharine Streets in 1921. The dedication of the current church building was held on January 28, 1923. Throughout our history we have partnered with Lutheran Immigration and Refugee Service and their predecessor organizations, to help welcome and resettle more than 250 displaced persons in the Hudson Valley. In the beginning, these were primarily from war-torn Europe; in more recent years they have included refugees from Southeast Asia, Africa and the Balkans. Members of the congregation have also offered literacy classes to the neighborhood’s extensive Mexican and Latino populations. Most recently, we have opened a “Welcome Center” to provide conversational English and friendship to Chinese immigrants working primarily in the local restaurant industry. First Lutheran hosts Repair Café an innovative, festive and free meeting venue that is all about repairing broken things together. What do you do with a chair when the leg has come loose? With a toaster that no longer works? Or a sweater with moth holes? Toss it? No way! You can repair it at the Repair Café which is set up periodically on Saturday mornings in the fellowship hall of First Lutheran Church. Those who participate will find tools, materials and repair specialists/coaches who volunteer their skills to help participants make any repairs needed – electricians, computer “geeks,” carpenters, seamstresses, bicycle mechanics, etc. all gather over coffee, tea and baked goods to share in an ongoing learning process. For those interested in volunteering, contact: Repair Café directly. You may also follow Repair Café on Facebook. For upcoming Repair Café dates please check the church calendar. Volunteers from First Lutheran Church partner with the Dutchess County Office for the Aging’s Senior Friendship Center, currently hosted by the Hudson Valley Community Center, in providing various activities throughout the week to enhance the experience of our senior friends. Relationships have deepened as our volunteers have shared their respective gifts of music, arts and crafts, knitting, card games, exercise sessions, monthly birthday parties and “good news” story telling with the seniors who participate in the Senior Friendship Center program five days a week. The back story on the Sisters is that they are the last three remaining members of a 500 year old German Lutheran order of nuns begun by Katarina von Bora, the hard-working and long-suffering wife of Martin Luther. The sisters take four vows, including the usual three of poverty, obedience and chastity (the one Sister Florious Glorious is always forgetting.) They then take an additional vow of perpetual motion. Since they must keep moving anyway, they offer their services to the old German Lutheran Churches, which are always in need of upkeep and repairs. The reality of their genesis , however, is that when the Sisters appeared in the Spring of 2009, our congregation was going through a very difficult time, and we were in serious need of morale-boosting. We were without a full-time pastor, and spirits were low. We needed some laughs, and the Sisters did their best to provide them. They began to appear at church dinners, bringing with them their bizarre mixture of music and mayhem. Who can forget their inspired line of undergarments called “Nunderwear?” Understanding the importance among Lutherans of a “firm foundation,” they offered the ever-popular “Wunderbar Wonder Bra.” In adding music to their act, the Sisters added another character, the perpetual novice, Hemiola Fermata, who while musically very gifted, is a martyr to Manischewitz. The Sisters, whose costumes were created by Linda, are occasionally joined by the choir of the Brothers of Perpetual Silence. You will all remember their very moving (with signs!) performance of the “Hallelujah Chorus.” Then there are also occasional guest appearances, such as that of Pastor Deborah, who as the Mother Superior sang “Climb Every Mountain” in the Sisters’ production of “the Sound of Music, “ in which the hills really were alive. And now a couple of videos for your enjoyment? Repairs: We provide tools and space for self-repair and offer help as needed. Education: We offer instruction on home repair, safe bicycle riding, road use etiquette, and other bike related topics. We meet at the First Evangelical Lutheran Church, 325 Mill St. Please refer to our calendar of events to find when the next sPOKe meeting will be. For information contact us via an email to John or call the church office at 845.452.6050. Informally known as “Pub Night,” members and friends of First Lutheran gather alternate Thursday evenings at 6 p.m. in a local brew pub for fellowship in the tradition of Martin & Katie Luther who loved to have conversation with friends around the table. Beverages and food are available for purchase. Please join us and feel free to bring a friend! In the summer months we typically gather in the beer garden at Schatzi’s Pub on lower Main Street in Poughkeepsie, and in the winter months, we meet at the Gino’s Pizzeria, at 706 Main Street. Please check our church calendar for upcoming “Table Talk” dates. Each year, under the auspices of our Social Action Committee, donations of money and turkeys are collected and some 20 Thanksgiving and Christmas food baskets are prepared for Grace Smith House, the local women’s shelter. Additional baskets are also provided for members of our congregation in need. From a list provided by Hudson River Housing, specific Christmas gifts are purchased for residents of the River Haven Independent Living program which houses at-risk youth. For a decade, and up until their new residence was recently built, the River Haven program was housed at First Lutheran’s Wetzel Hall facility, next door to our church at 45 Catharine Street.